She's waiting for you over here. Just as wonderful as the little pink kitty. I agree, she is lovely. And does look cuddly! This is just so beautiful. You are so clever! aww she is so unique! What a sweetie! 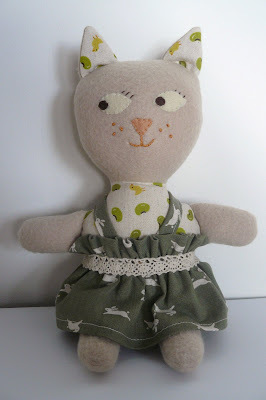 Love that rabbit fabric. oh gorgeous...such a cute expression on her face! Ahh how lovely, she looks great.